To inquire about upcoming tour dates, schedule a gig or workshop, or for other information, contact me via the webform. I look forward to hearing from you! Music is definitely part of Darrell Green’s family pedigree — his father was a bass player after all — but this jazz drummer also has his own preternatural sense of groove. Over a career that’s spanned more than two decades, Green has become a master technician and prolific sideman, sharing stages with everyone from Blue Note vibraphonist Stefon Harris to saxophonist Red Holloway. Though jazz is his primary focus, Green is conversant in every genre from straight-ahead jazz to Latin and West African music. Oakland-raised Green has been playing drums for as long as he can remember. In fact, his first birthday present was a toy drum. When he was 7 years old, Green landed his first professional gig at Cosmopolitan Baptist Church. Four years later he matriculated in the Young Musicians Program at UC Berkeley and apprenticed under Kent Reed. “He would take me to his gigs. I would help him set up so I got exposed to the real life of a musician,” says Green. During high school Green was a section leader in both the Young People’s Symphony Orchestra and the Bay Area Wind Symphony. Additionally, he played drums in the Castlemont High School Jazz Band and backed the Castleers choir. 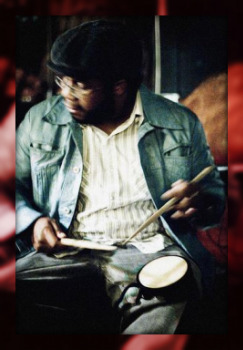 After high school, Green attended the California Institute of the Arts on a scholarship, where he majored in jazz studies with an emphasis on African percussion. Throughout college Green drove up to the Bay Area every weekend to play a trio gig at San Francisco’s Club Deluxe, which featured Marcus Shelby on bass and Howard Wiley on saxophone. In 2001 he began touring with Lavay Smith and Her Red Hot Skillet Lickers, and also formed a trio with guitarist Julian Lage and bassist David Ewell. Two years later, Green joined the Dave Ellis Quintet and performed at the Monterey Jazz Festival. He consolidated his career as a gun-for-hire, and started getting calls from heavyweights like Harris and Dr. Lonnie Smith whenever they came to town. He developed a style that’s rooted in modern post-bop, but retains elements of his gospel and classical lineage. As a soloist, Green became known for his bedrock groove and inexhaustible creativity. In 2005 Green landed a scholarship at the Manhattan School of Music, where he began a comprehensive study of jazz performance. Shortly thereafter he began working with David Weiss, saxophonists JD Allen and Sherman Irby, and the Myron Waldon/Daron Barrett Quartet. He became a sought-after musician for both session work and live shows. Green has toured with James Hurt, James Zollar, Brad Leali, Jesse Davis, and Stacy Dillard. Currently, he is touring with Pharoah Sanders, Dr. Lonnie Smith, Sherman Irby, Steve Turre, Faye Carol, Lavay Smith and the Red Hot Skillet Lickers, and Jeremy Pelt. He is one of the most in-demand drummers in New York , Europe, and Japan.